The use of platelet rich plasma (PRP) injections in the treatment of fasciosis and tendinosis about the foot and ankle is a fairly recent and evolving concept. The idea behind such injections is quite simple and has been well studied in the literature. The concept is that there is a loss of inflammatory response and chronic scar formation with fascia and tendon injuries. The proper terms for such injuries are fasciosis and tendinosis rather than the more commonly used terms of fasciitis and tendonitis. In fasciitis and tendonitis cases, there is good blood supply to the problematic region but there is an inflammatory response that is painful. In fasciosis and tendinosis issues, the fascia and ligament have a decrease in inflammatory response, a reduction in the growth/healing factors and a chronic scar formation that prevents the healing process. It is ironic that we usually try to treat such issues on the acute (fasciitis/tendonitis) cases with rest while we try to treat the chronic issues (fasciosis/tendinosis) with cortisone injections. This does not make sense as an anti-inflammatory injection such as cortisone has a better chance of working in the acute phase when there is still an inflammatory process that is working. With chronic injuries such as Achilles tendinosis and plantar fasciosis, cortisone injections do not help very much. There is no inflammatory process with these injuries and the injection only works via the trauma caused by the needle, resulting in an inflammatory response in the designated area. Alternatively, platelet rich plasma injections are very useful in chronic injury cases as they restart and stimulate the inflammatory cascade, which enhances the healing process. Again, an injection without control of the underlying cause of injury will not result in as good an outcome as post-injection support and a decrease in the cause of the problem. For example, in a plantar fasciitis case, it is better to give an injection of cortisone during the first or second visit if the patient is not responding to conservative care such as stretching, icing and therapeutic exercises. However, when a patient has had plantar fascia pain for six months and there is a great deal of scar formation, a cortisone injection is of far less relevance than a platelet rich plasma injection to restart the inflammatory and healing cascade. In regard to platelet rich plasma injections, patients with plantar fasciitis for six months should wear a boot for the first two weeks after injection. This allows the fascia time to heal without chronic tension and allows the growth factors to work without continued trauma. Histologic samples from chronic tendinosis and fasciosis cases have shown no inflammatory response. What researchers have shown is a limitation of the normal tendon repair system with a fibroblastic and vascular response, known as angiofibroblastic degeneration.1-3 The traditional treatment options such as cortisone have relied on a decrease in the inflammatory process. However, research has shown adverse reactions to cortisone use, especially in tendons, including atrophy and structural changes.2 Newer treatments such as dry needling, prolotherapy, extracorporeal shockwave therapy, Topaz therapy (Arthrocare) and platelet rich plasma therapy focus on increasing the inflammation response rather than suppressing it. At my institute in Los Angeles, my co-workers and I have performed PRP injections for all of the major tendons in the foot and ankle, as well as the plantar fascia. The majority of PRP injections we perform are for plantar fascia and Achilles tendon issues. Using PRP injections for posterior tibial tendon and peroneal tendon issues is slightly less common at our facility. One would perform the injection process in the office. The physician may use a straight local anesthetic with the patient lying in a comfortable position on a flat table. Inject the local anesthetic in the skin and soft tissue about the region of injection. One can also place the local anesthetic about the tendon or fascia region if desired. Ultrasound guidance is not essential but has allowed for far more accurate and improved placement of the injection material in our hands. We use the ultrasound machine to identify the region of greatest trauma and fibrosis, and to ensure the most accurate placement possible with the injection. Draw the patient’s blood in a sterile fashion and spin it down using the platelet rich plasma kit in order to produce only the platelet rich material for injection. With ultrasound guidance, advance the needle through a sterile setup to the level of the traumatic region. Place the needle within the tendon or fascia, and not around the tendon or fascia. It is essential to traumatize the tendon or fascia to some extent to allow the inflammatory response to increase. Usually a 30-cc blood draw produces 4 cc to 6 cc of platelet rich plasma material, which is sufficient for most injection types in the foot and ankle. Place the injection within the tendon or fascia, and use a peppering effect to inject small amounts of the growth factor into the traumatized area. Spread the injection over the entire traumatized region while placing the needle in and out of the traumatized area to break up the scar tissue and fenestrate the tendon or fascia. The injection process takes about two minutes in order to pepper properly and fenestrate the region with adequate microtrauma. Following injection, I prefer to put a patient into a below-the-knee walking boot to provide adequate support and decrease stress on the fascia. I will sometimes add a heel lift in the boot if there is a severe equinus. Keep patients in the boot for two weeks and then progress them to a stiff tennis shoe and orthotics or over-the-counter insoles. One can allow stretching after injection as desired and as per patient tolerance. However, the physician should advise the patient not to use icing or anti-inflammatory medications for the first two to three weeks. Currently, when it comes to plantar fasciosis, our institute will begin with conservative are and progress to “in between” treatment prior to a plantar fascia release. The first treatment we attempt if conservative care has failed is an in-office platelet rich plasma injection. If this does not work, we progress to the Topaz micro plantar fasciotomy procedure or fascia release depending on the patient’s financial status and recovery needs. 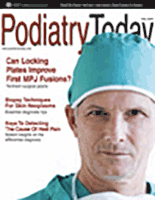 We have found that 70 percent of patients with plantar fasciosis improve to the point of having minimal to no pain following the PRP treatment and do not progress to any further surgical treatment after injection. Thirty percent of patients have needed a second injection in the two-month period after the first injection for full recovery. While we are still compiling our results, we have thus far found PRP therapy to be an excellent and fairly non-invasive measure for the treatment of plantar fasciitis/fasciosis and Achilles tendonitis/tendinosis. 1. Mishra A, Pavelko T. Treatment of chronic elbow tendinosis with buffered platelet-rich plasma. Am J Sports Med 2006; 10(10):1-5. 2. Jobe F, Ciccotti M. Lateral and medial epicondylitis of the elbow. J Am Acad Orthop Surg 1994; 2(1):1-8. 3. Edwards SG, Calandruccio JH. Autologous blood injections for refractory lateral epicondylitis. Am J Hand Surg 2003;28(2):272-8. 4. Sampson S, Gerhardt M, Mandelbaum B. Platelet rich plasma injection grafts for musculoskeletal injuries: a review. Curr Rev Musculoskelet Med 2008 1(3):165-174. 5. Everts P, Knape J, Weirich G, Schonberger J, Hoffman J, Overdevest E, et. al. Platelet-rich plasma and platelet gel: a review. J Extra Corpor Technol. 2006; 38(2):174-87.